This experience is commonly performed in the circle between eleven and twelve o'clock, or between three and four. 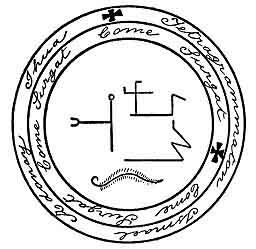 [paragraph continues] CORICACOEM, SCIRCIGREUR, I require thee to give me very humbly, &c.
I conjure thee, Lucifer, by the living God, by the true God, by the holy God, Who spake and all was made, Who commanded and all things were created and made! I conjure thee by the Ineffable Names of God, ON, ALPHA and OMEGA, ELOY, ELOYM, YA, SADAY, LUX, MUGIENS, REX, SALUS, ADONAY, EMMANUEL, MESSIAS; and I adjure, conjure, and exorcise thee by the Names which are declared under the letters V, C, X, as also by the Names JEHOVAH, SOL, AGLA, RIFFASORIS, ORISTON, ORPHITNE, PHATON IPRETU, OGIA, SPERATON, IMAGON, AMUL, PENATON, SOTER, TETRAGRAMMATON, ELOY, PREMOTON, SITMON, PERIGARON, IRATATON, PLEGATON, ON, PERCHIRAM, TIROS, RUBIPHATON, SIMULATON, PERPI, KLARIMUM, TREMENDUM, MERAY, and by the most high Ineffable names of God, GALI, ENGA, EL, HABDANUM, INGODUM, OBU ENGLABIS, do thou make haste to come, or send me N., having a comely and human form, in no wise repulsive, that he may answer in real truth whatsoever I shall ask him, being also powerless to hurt me, or any person whomsoever, either in body or soul. 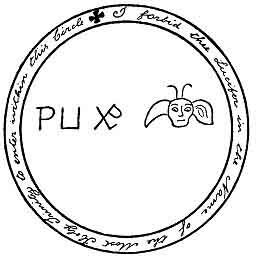 This experience is performed in its proper circle at night from nine to ten o'clock, and the first stone found is given to him. He is to be received with dignity and honour. 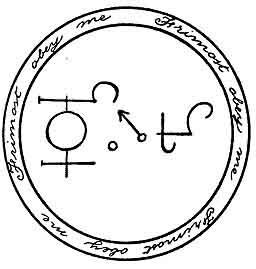 Proceed as on Monday; compose the circle, and write about it: Obey me, FRIMOST! Obey me, FRIMOST! Obey me, FRIMOST! thee, NAMBROTH, by thy name, by the virtue of all spirits, by all characters, by the Jewish, Greek and Chaldean conjurations, by thy confusion and malediction, and I will redouble thy Pains and torments from day to day for ever, if thou come not now to accomplish my will and submit to all that I shall command, being Powerless to harm me, or those who accompany me, either in body or soul. This experience is performed in its circle at night, from ten to eleven o'clock; it is designed to obtain the good graces of the King and others. 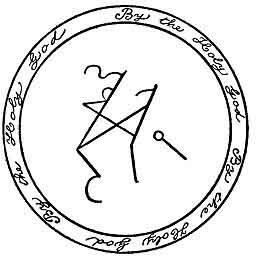 Write in the circle as follows: Come, ASTAROTH! Come, ASTAROTH! Come, ASTAROTH! Prophets, Apostles and Evangelists sing without end; Hosannah, Hosannah. Hosannah, Lord God of Hosts, Who art, Who wast, Who art to come, as a river of burning fire! Neglect not my commands, refuse not to come. I command thee by Him Who shall appear with flames to judge the living and the dead, unto Whom is all honour, praise and glory. Come, therefore, promptly, obey my will; appear and give Praise to the true God, unto the living God, yea, unto all His works; fail not to obey me, and give honour to the Holy Ghost, in Whose name I command thee. This experience is made at night, from three to four o'clock, at which hour he is called, and appears in the form of a King. 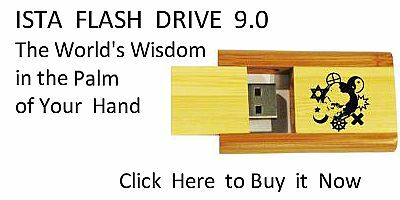 A little bread must be given him when he is required to depart; he renders man happy and also discovers treasures. Write about the circle as follows: Holy God! Holy God! Holy God! being Powerless to do harm unto me or any person whomsoever, either in body or soul. o'clock, and a nut must be given to him. 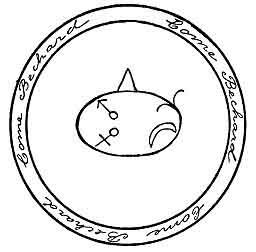 Write within the circle: Come, BECHARD! Come, BECHARD! Come, BECHARD! without any prejudice to my body or soul, without harming my book or doing injury to those that accompany me. on the spot. 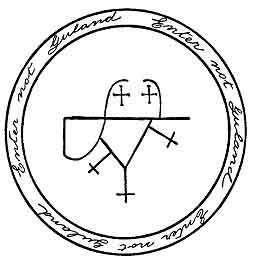 Write in his circle: Enter not, GULAND! Enter not, GULAND! Enter not, GULAND! [paragraph continues] Trinity. Come without inflicting any harm upon me, without injury to my body or soul, without maltreating my books or anything which I use. I command thee to appear without delay, or, that failing, to send me forthwith another Spirit having the same Power as thou hast, who shall accomplish my commands and be submitted to my will, wanting which, he whom thou shalt send me, if indeed thou comest not thyself, shall in no wise depart, nor until he hath in all things fulfilled my desire. TETRAGRAMMATON. ISMAEL, ADONAY, IHUA. 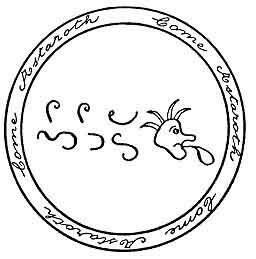 And in a second circle: Come, SURGAT! Come, SURGAT! Come, SURGAT! I conjure thee, O SURGAT, by all the names which are written in this book, to present thyself here before me, promptly and without delay, being ready to obey me in all things, or, failing this, to despatch me a Spirit with a stone which shall make me invisible to every one whensoever I carry it! And I conjure thee to be submitted in thine own person, or in the person of him or of those whom thou shall send me, to do and accomplish my will and all that I shall command, without harm to me or to any one, so soon as I make known my intent. over this Place, of whatsoever legion you be and of whatsoever part of the world; by order of the Most Holy Trinity and by the merits of the Most Holy and Blessed Virgin, as also of all the saints, I unbind you all, spirits who abide in this place, and I drive you to the deepest infernal abysses. Thus: Go, all Spirits accursed, who are condemned to the flame eternal which is Prepared for you and your companions, if ye be rebellious and disobedient. I conjure you by the same authority, I exhort and call you, I constrain and command you, by all the Powers of your superior demons, to come, obey and reply positively to what I direct you, in the Name of Jesus Christ. Whence, if you or they do not obey promptly and without tarrying, I will shortly increase your torments for a thousand years in hell. I constrain you therefore to appear here in comely human shape, by the Most High Names of God, HAIN, LON, HILAY, SABAOTH, HELIM, RADISHA, LEDIEHA, ADONAY, JEHOVA, YAH, TETRAGRAMMATON, SADAI, MESSIAS, AGIOS, ISCHYROS, EMMANUEL, AGLA, Jesus Who is ALPHA and OMEGA, the beginning and the end, that you be justly established in the fire, having no Power to reside, habit or abide in this Place henceforth; and I require your doom by the virtue of the said Names, to wit, that St. Michael drive you to the uttermost of the infernal abyss, in the Name of the Father, and of the Son, and of the Holy Ghost. So be it. I conjure thee, Acham, or whomsoever thou mayest be, by the Most Holy Names of God, by MALHAME, JAE, MAY, MABRON, JACOB, DASMEDIAS, ELOY, ATERESTIN, JANASTARDY, FINIS, AGIOS, ISCHYROS, OTHEOS, ATHANATOS, AGLA, JEHOVA, HOMOSION, AGA, MESSIAS, SOTHER, CHRISTUS VINCIT, CHRISTUS IMPERAT, INCREATUS SPIRITUS SANCTUS. 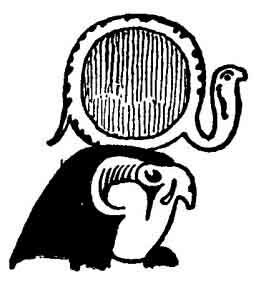 HORUS-RA, WEARING THE SOLAR DISC AND URÆUS. 286:1 This is in opposition to the higher counsels of the averse art, which enjoins a certain reverence in addressing the lost angels, presumably on account of what they were. 296:1 It is impossible to restore the Latin so that it shall possess an intelligible and constructive sense.